Dolphin is committed to academic excellence, healthy standards in co-curricular practices, socially relevant activities, and courses leading to employment and entrepreneurship and continuous progress of the institution. In this way, it is “ready for good work” in collaboration with the government and people of goodwill including academicians and educationists, to create a society more worthy of human beings. Its motto is also to train youths who can be gainfully employed for the overall development of the civil society at large. The Institute is affiliated to H.N.B. Garhwal Central University, Srinagar, Garhwal (Uttarakhand) and is also approved and recognized by the State Govt. of Uttarakhand. The institute is accredited by NAAC, an autonomous body funded by UGC, and recognized by UGC u/s 2(f). The Institute is also approved by Indian Association of Physiotherapists (IAP), Mumbai and National Council for Teachers Education (NCTE), Jaipur. 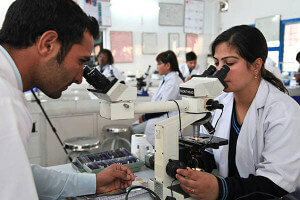 The institute is reputed country wide for academic excellence and offering well focused programmes in biosciences. This reputation is further reflected through our academic staff and cosmopolitan student body, as they come from different states of the country. During 2011 the institute is accredited by NAAC up to 2016, an autonomous body funded by UGC that assesses and accredits Institutions of Higher Education in India. It is one of the first self financed institutes in the state to have been provided with this accreditation. On achieving satisfactory progress in academics at Post Graduate level in last 11 years, the institute has rightfully entered in the field of research activities at the Ph.D. level. A number of research scholars are enrolled in various departments. Research projects funded by Government agencies are being carried out by the faculty of the institute. At least 03 Ph.D. were awarded during 2011-12. The faculty of Dolphin published some landmark Research Books recently. A few patents were also awarded. Thus, beyond post graduation there are opportunities for further learning and career development. The institute makes best efforts to provide intellectual education with learning methodology that reflects best practice in educating young minds. With spacious and well furnished class rooms and specialized laboratories to give the students a globally standardized facilitation, the institute is positioned as a premier center for scientific learning. The institute has identified potential sectors which will soon spell the boom of the country’s economic growth. Life sciences such as biotechnology, industrial biotechnology, microbiology, medical lab technology, biochemistry, forestry, agriculture, pharmachemistry and physiotherapy are gaining immense popularity. India is no longer content to be an “outsourcing centre” for the West. And, without a doubt, life sciences will assume an advantageous position in this unique phase of economic growth to find opportunities for innovation and refined development of crucial industrial sectors. The institute has fully outfitted laboratories for all the streams and these are equipped with state of art educational and research instruments. ICT enabled modern classrooms, Wi-Fi campus, well stocked library and an e-library, separate hostels for the boys and girls. The learning environment provided at the campus motivates the students to learn more and assist them in building their excellent career. Surrounded by a thick forest cover and captivating natural fauna and flora, the Dolphin (PG) Institute lies on the outskirts of Dehra Dun. Upon entering the campus, the first thing one notice is a sense of calm amidst a flurry of activities. The peaceful atmosphere and the salubrious climate provide a perfect setting for young minds to absorb knowledge. The institute presents a picture that is full of life and cheerful energy. Dehra Dun is one of the most elegant city in North India. It combines the practical advantages of a small, friendly, inexpensive city with pleasant weather and recreational amenities of a successful and modern state capital. Dehra Dun has multi-cultural environment where all communities and beliefs are represented and respected.